Our goal at Outdoor Living Ideas is simple. We want to provide you with the best ideas and products for creating incredible outdoor living spaces of your own. Whether your patio or deck is just in the planning stages or more advanced you can make the most of the season with unique garden and patio decor, outdoor fireplaces, gazebos and more. We work hard to find high quality outdoor living products, garden and patio decorations and accessories for your outdoor rooms. We also try to provide you with the best outdoor living space ideas so you can create outdoor living designs that are uniquely your own. More and more folks are discovering the pleasure and enjoyment of patio living. And with good reason. With the economy in a slump, the future of housing prices in question and tighter lending requirements many Americans are deciding to stay put and make the most of what they already have. You can build beautiful and functional outdoor living spaces on a budget too. Adding a deck or patio is probably the cheapest way to increase your living space. Not to mention it feels incredibly good to be outside instead of cooped up in the house. You should put your outdoor living ideas down on paper first because it will help you visualize them. Decide what you want your patio or deck to accomplish and how much space is available to do it in. Do you entertain a lot or is the purpose of your outdoor room more of a restful retreat? What about outdoor cooking? Will it be something you do regularly? Will you need a dining area? While outdoor living designs are plentiful you need to consider the bottom line for your project. Not everyone can afford to create the perfect outdoor living space all at once. If your plans are simple you may be able to do this but if they are more grandiose you may need to tackle the project in phases. This is why you want to plan things out before you start. That way you can lay the groundwork for what is to come. If you know you are going to want an outdoor kitchen for example but can’t afford it right away, plan for where you want to put it. This will be much better than trying to squeeze it in somewhere later on. At it’s most basic level you need a space you can define. What kind of floor will your outdoor room have? Do you have an existing patio or deck area to use or expand upon, or will you be starting from scratch? There a several choices available for your patio’s surface. You can of course just use a level grass surface. 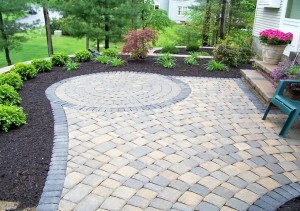 You can create interesting patterns for your patio with brick pavers and they are a popular choice. Poured concrete is another option and there are techniques to make it look more like natural stone such as stamped concrete if you so desire. If you are planning a deck instead of a patio you will have a choice of natural wood or composite materials. Composite decking is virtually maintenance free and will generally last longer but it is also a lot more expensive. You may want to consider how long you plan on living in your present location before making a buying decision. Once you have decided on the surface for your outdoor room you are going to need patio furniture. The most important thing is to choose outdoor furniture that is comfortable. There is no point in creating an area if you don’t want to sit in it! There are a multitude of styles of patio furniture and what you choose is a matter of personal taste and your budget. You can find inexpensive garden furniture at you local Lowes or Home Depot or you can purchase designer furniture that can run into thousands of dollars. Bear in mind that in most cases you get what you pay for though. Your plan will dictate what type of outdoor living furniture you need whether it’s just a few Adirondack chairs or a full blown conversation set or an outdoor bistro table or a more formal dining set. To get the most of your outdoor living area you will undoubtedly want to look at patio heaters as a way to extend your season. Outdoor fireplaces or fire pits can help you extend the season and keep you comfortable on cool nights while adding extra ambiance. 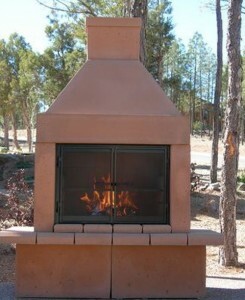 Chimineas are an often overlooked patio heater with many advantages. Patio heaters like these may be wood burning or use gas or may even choose infrared patio heaters that can be hung from the ceiling set on the floor, or placed on a table. Now, even those of us that aren’t blessed with a California climate can enjoy casual outdoor living most of the year. Of course food naturally taste better cooked outside and patios and decks seem to go hand in hand with BBQ. There are electric, charcoal and gas grills for outdoor cooking to accommodate any space, budget and cooking style. 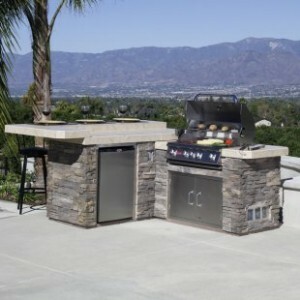 You may want to consider an outdoor kitchen, especially if you entertain a lot or enjoy cooking. Your food will taste better and during hot summer days an outside barbecue beats slaving over a hot stove any day. Feeling cramped and need more space? Outdoor enclosures can add needed space and help define the use of a given area. 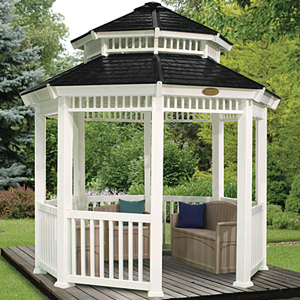 Why not add a gazebo or pergola. The great thing about pergolas is their ability to define space without closing it off. If you want a bit more protection from the elements then a covered gazebo will extend your outdoor season besides offering a pleasant place to sit and relax. Most folks think of the classic Victorian type of gazebo but there are also cloth gazebos available that are often called pavilions. 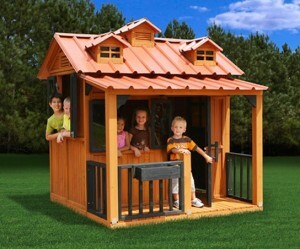 What about an outdoor playhouse or old-fashioned sand box for the kids? It’s a great way to get them out of the house and your hair. We have dog houses for Rover and cat enclosures for kitty too. Every gardener needs a garden shed to store their tools and supplies. It takes more than a yard and some plants to create an attractive outdoor living space. You will want to add some garden decor to add points of interest to the landscape. There are many types of garden decor to choose from too. There are angel statues, animal statues to name just a few. 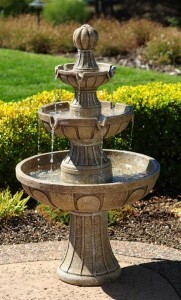 You may want to add a bird bath to attract wildlife or a solar powered fountain. Adding a water feature is a great idea because the sound of running water is so relaxing. There are many attractive water features that use recirculating pumps to add the restful, relaxing tones of running water. 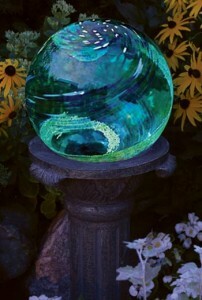 Garden statues, birdbaths, fountains and gazing balls all add points of interest in the landscape. 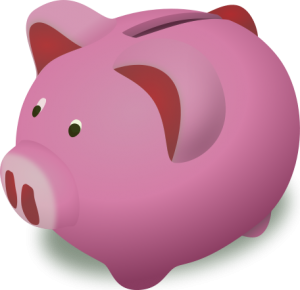 These items are generally inexpensive and can really enhance the area giving a big bang for your dollar. You can enjoy a garden bridge even without water or you could even build a pond for it and stock it with goldfish or koi. 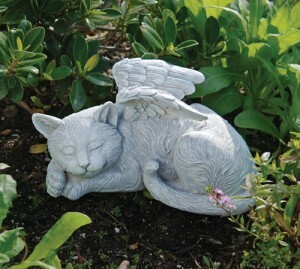 More than anything garden decor lets you add your own unique style to any area. On a more somber note, many of us have lost a beloved pet. They certainly have a way of entwining themselves into our daily lives. 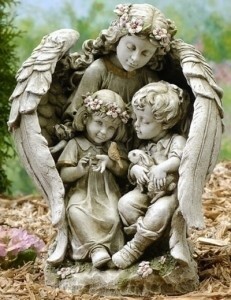 Maybe a pet memorial in a quiet area can help bring back fond memories and can help healing. Don’t forget to add some outdoor lighting to your deck or patio. You will undoubtedly be spending time there after dark. 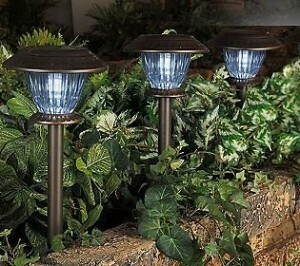 Besides the obvious safety reasons for adding it, outdoor lighting can be used to create a whole new world after dark. Decorative string lights can add a festive touch to any yard. Spot lights can be used to highlight garden ornaments and solar lighting can be used to illumine garden paths. You can choose from a wide variety of landscape and patio lights so use your imagination and get creative. There are many decorative home accents to choose from to add your own personal touch and flair. While you may be focusing on your backyard don’t neglect the front of your home! The old saying that you only get one chance to make a good impression is certainly true for your home too. 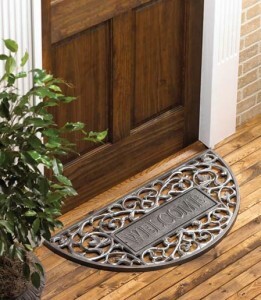 So greet your guests with a custom door mat and other amenities for the front of your home like custom address plaques, mail boxes and attractive lighting. Give your home added curb appeal with window boxes, weather vanes for the roof or other items that will make your home unique and leave a lasting impression. Many of these things are relatively inexpensive yet can make a huge impact on your home’s overall appearance. Patios and decks are natural places for container gardening. How about fresh herbs to go with your grilling? Landscaping themes can be tied into the deck or patio with planters. Take advantage of arbors or trellises to provide natural screening for privacy and to tie indoor and outdoor living spaces together. The right combination of landscaping and hardscaping elements will allow our spaces to flow from one to the other naturally. Think of your backyard patio or deck as an extension to your home rather than a separate entity. When it comes to outdoor living ideas only the sky and your imagination are the limit so why not create something beautiful to share with friends and family. Outdoor Living Lets You Take It Outside!